Hello again! 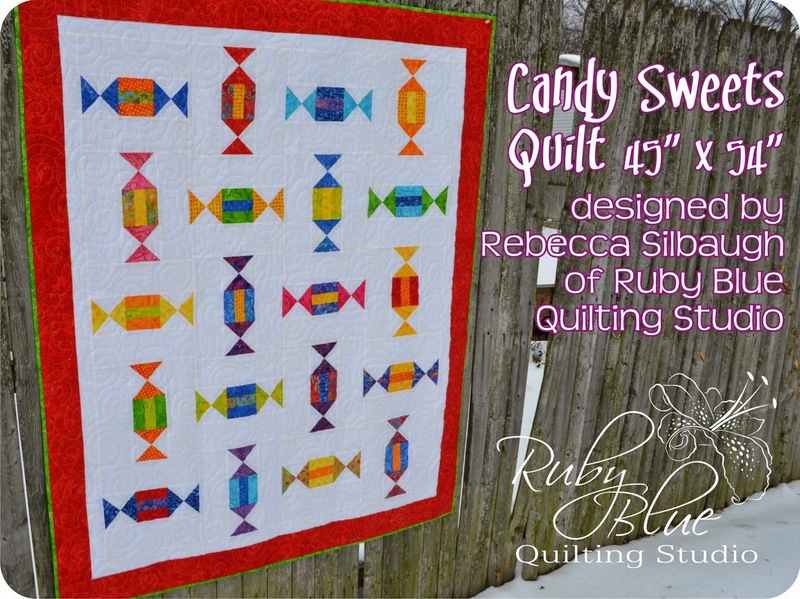 I am Rebecca Silbaugh from Ruby Blue Quilting Studio, back at SewTimeless to share another tutorial with you using Tonga Treat pre-cuts! Today I bring to you Candy Sweets! Now here in my little corner of the world, it’s been cold. And snowy if you can see it in the picture. This time of year makes me think of comfort, and what’s more comforting than sweets?! 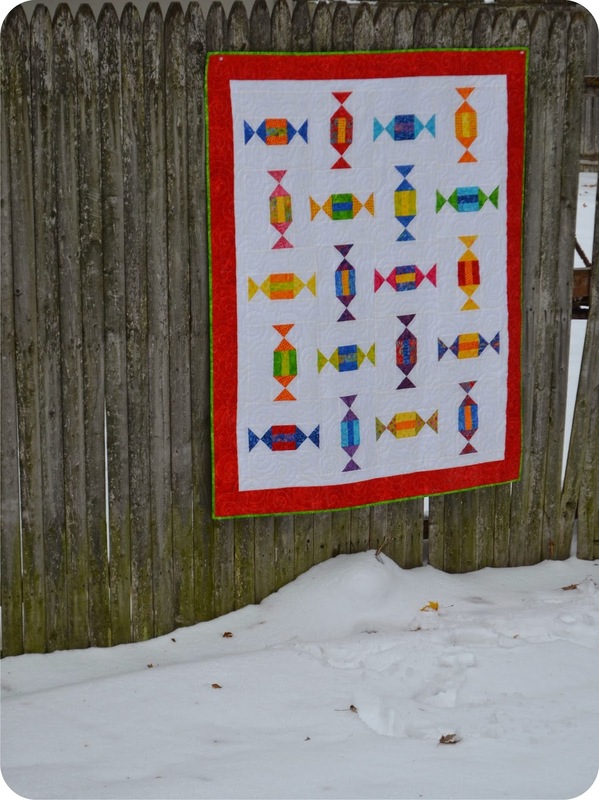 I came up with this little quilt that would make a great wall hanging, or a table topper to grace the dessert table at your next gathering, or be a backdrop for your cookie exchange… The possibilities are endless! So let’s get started! 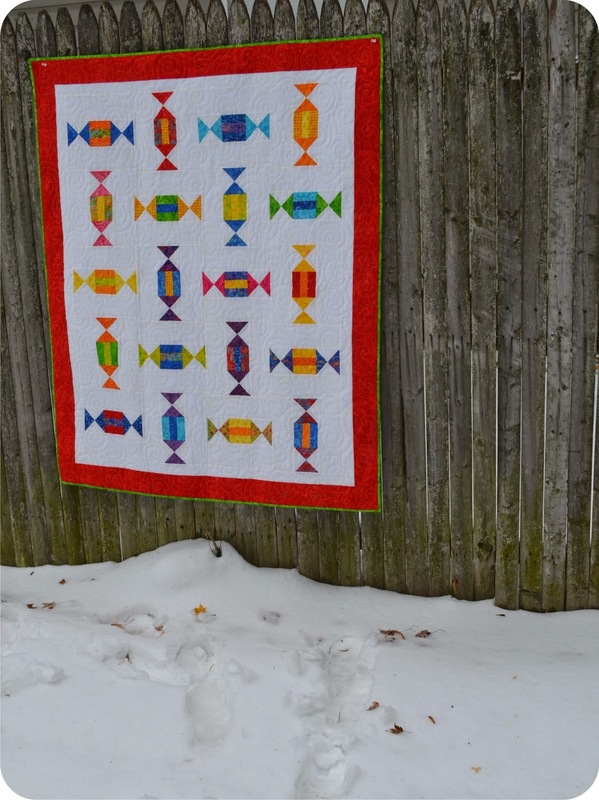 3 yards for backing – pick your favorite from Tonga Carnivale coordinating yardage! Note: All seam allowances are 1/4″ unless otherwise stated. WOF = Width of Fabric. To begin, sort your Tonga Treat Mini squares into two piles. One pile of 20 squares will be for the “wrappers” of the candy, the other pile of 15 squares will be for the candy centers. 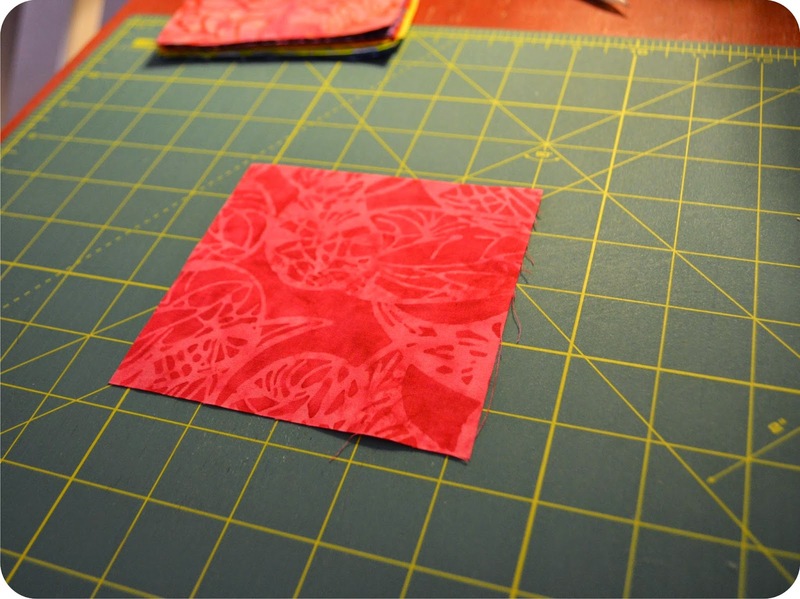 Cut the 15 squares for the centers into four pieces 1 1/2″ x 3 1/2″ as shown. 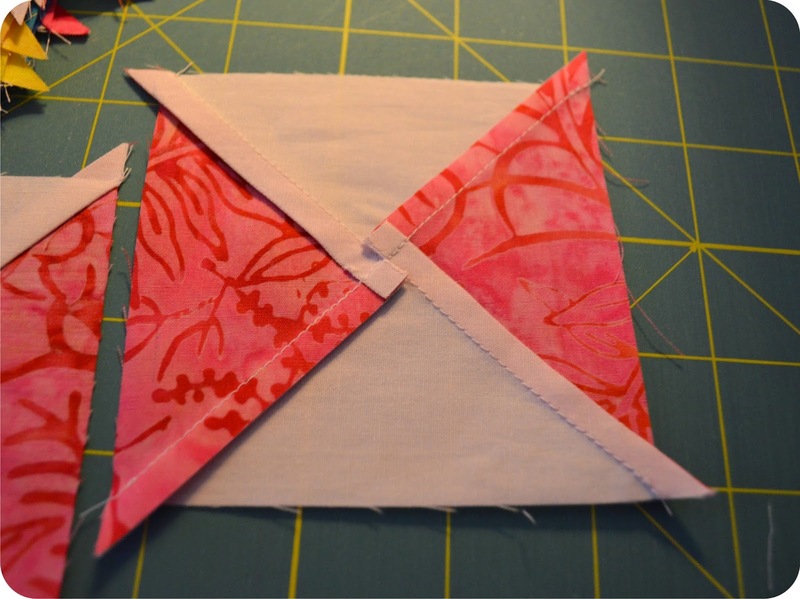 These squares may be just a tad larger than 5″ square, so be sure to measure and trim down as needed. You can discard all of the pieces marked with an “x” in the picture above. From the background fabric, trim 3 strips 4 1/2″ wide. 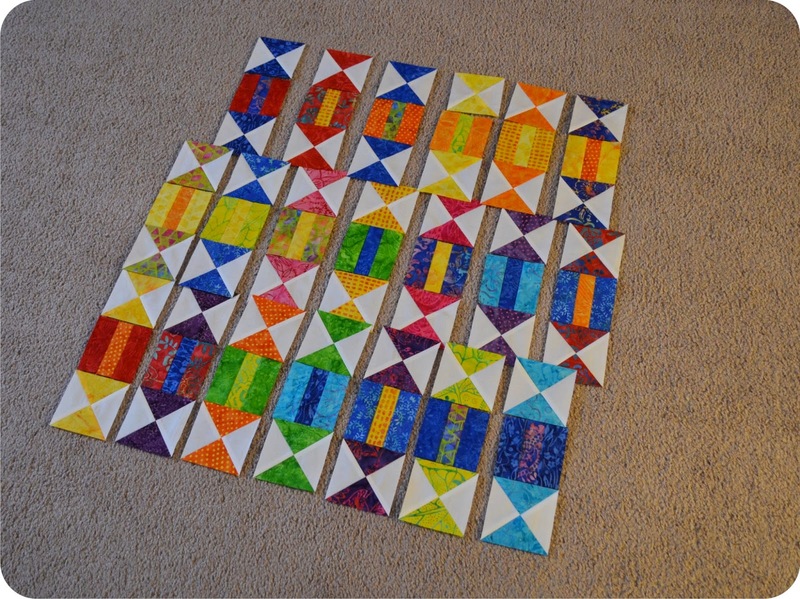 From these strips, cut 20 squares 4 1/2″ x 4 1/2″. 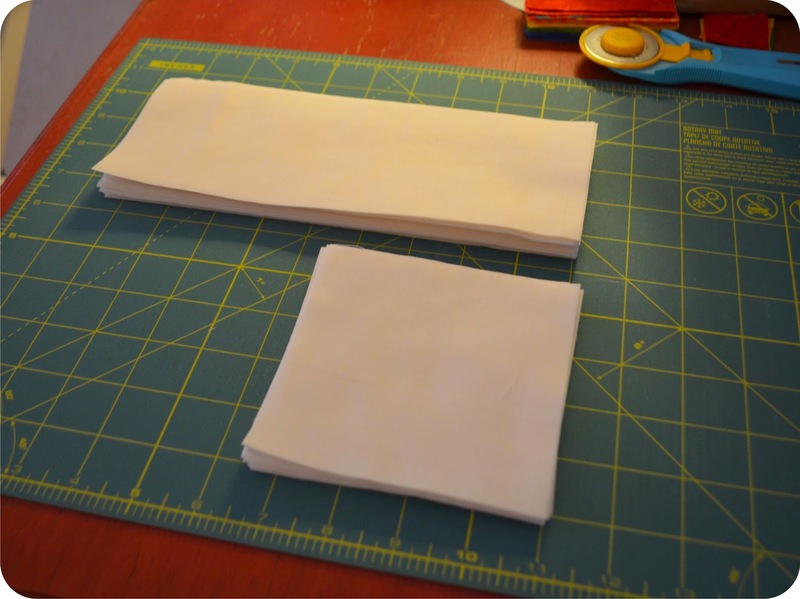 Also cut 10 strips 3 1/2″ wide. From these strips, cut 40 pieces 3 1/2″ x 9 1/2″. 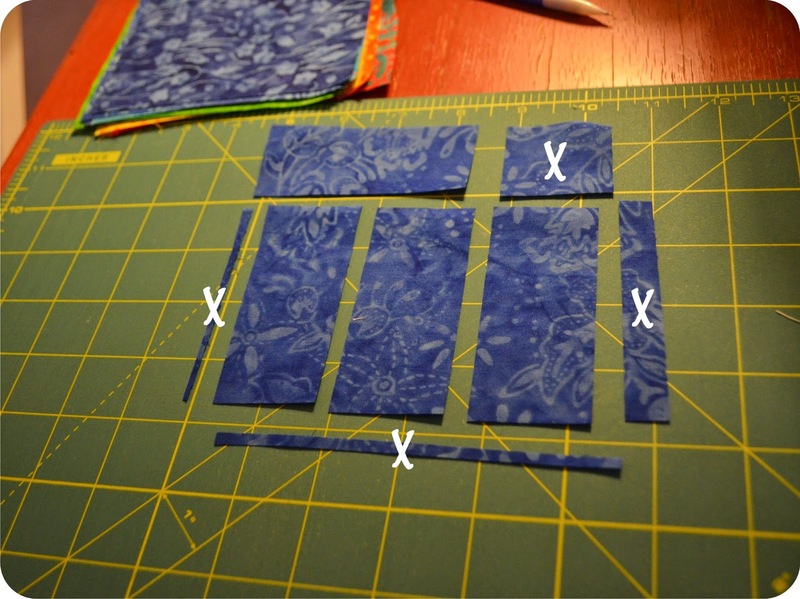 Lastly, cut 5 strips 2″ x WOF for the inner border. 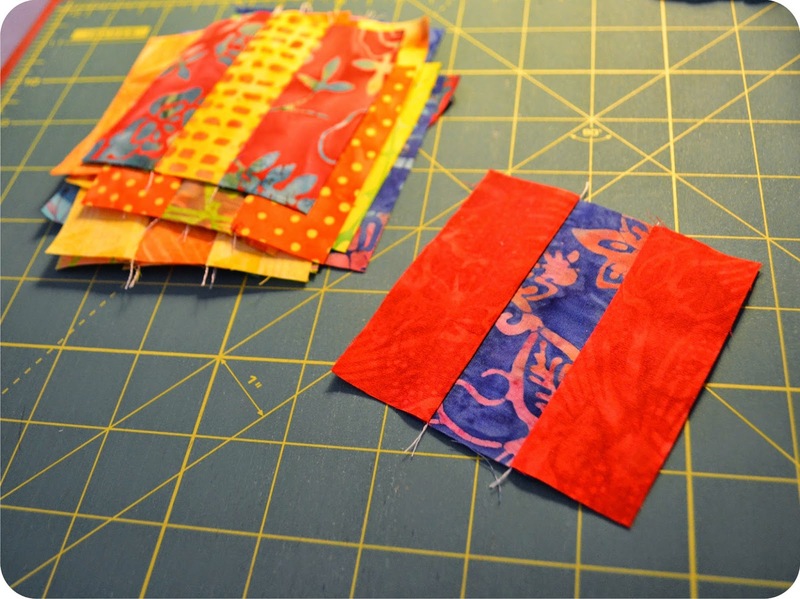 From the red border fabric, cut 6 strips 3 1/2″ x WOF for the outer border. Now with the cutting done, let’s move onto construction! For the candy centers, create 20 sets of three 1 1/2″ x 3 1/2″ strips. I paired all of my outer pieces with a contrasting center strip, but feel free to play and have fun with these! Press the seam allowances towards the outer strips. Make 20 centers. 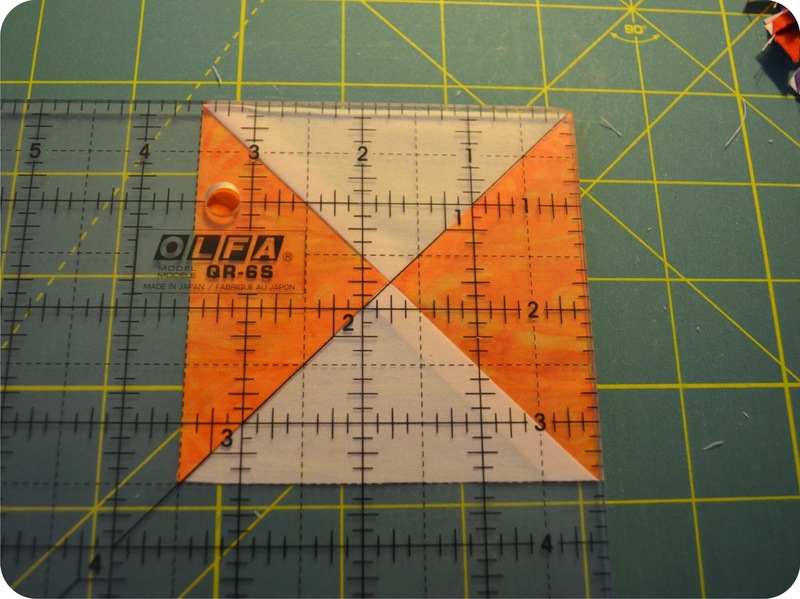 Mark a diagonal on all of the background 4 1/2″ squares. Pair each marked background square with a random colored square. 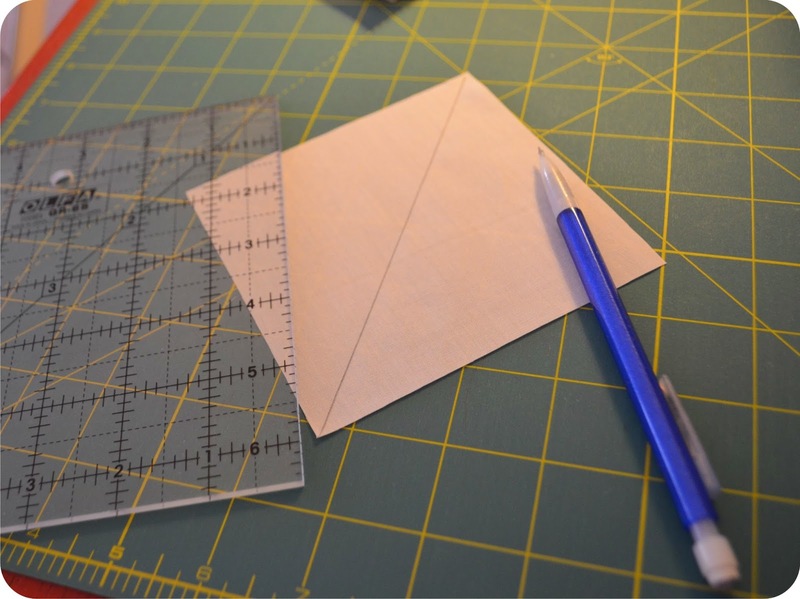 Stitch a line 1/4″ from both sides of the drawn line. Cut along the drawn line and press the seam allowances towards the colored fabrics. DO NOT TRIM at this point. You should now have two matching Half Square Triangle units. We need to make these into Quarter Square Triangles, so to do that, mark the diagonal onto the wrong side of ONE of the HST units from each pair. With the seam allowances pressed to the colored fabrics, the seams should “nest” together. Stitch 1/4″ from both sides of the drawn line as before. Here’s a better picture of the clipped seam and the pressing. Just press the seam in the same direction as the other seams and you’ll be fine. These blocks will be trimmed to measure 3 1/2″ square. 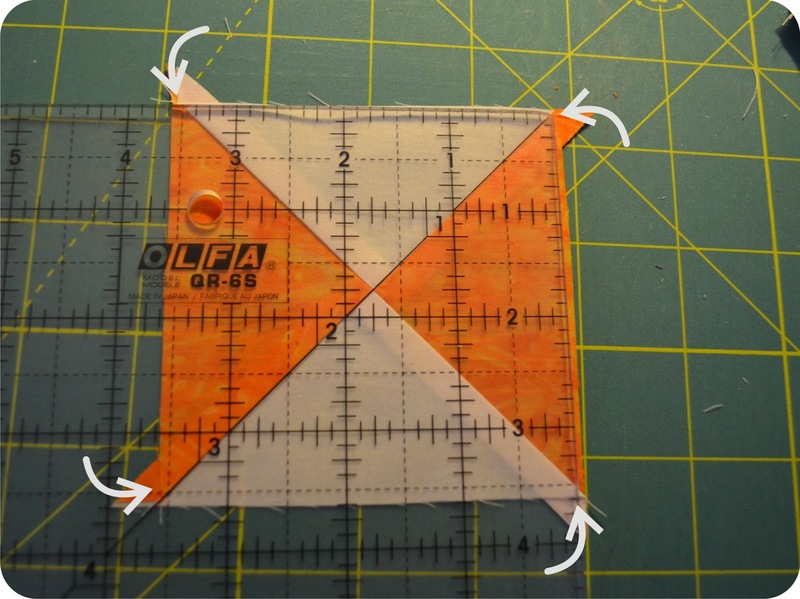 If you need to mark your ruler with tape or dry erase markers, do so, but you’ll start by lining up the 45 degree angle with one seam of the block. Then if you follow all of the 3 1/2″ markings from there, make them align so they line up along the seam lines in the block (shown with the arrows above). The first block is a little tricky to get it all aligned, but once you know what you’re looking for, you’ll sail right through the rest. 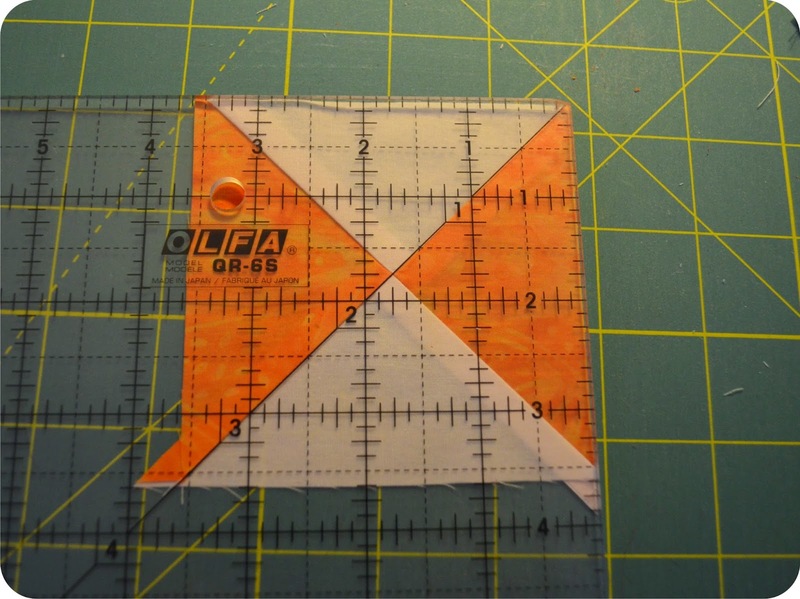 Then rotate the block 180 degrees to align with the 3 1/2″ markings. Trim the last two sides. Now, there are specialty rulers out there, so if you have them, try them! But, if you don’t have anything fancy, you don’t need it either. Most rulers come with at least one corner marked with the 45 degree line, so as long as you have that marking, you’re fine. I use a smaller ruler for this type of trimming because it’s easier to maneuver. 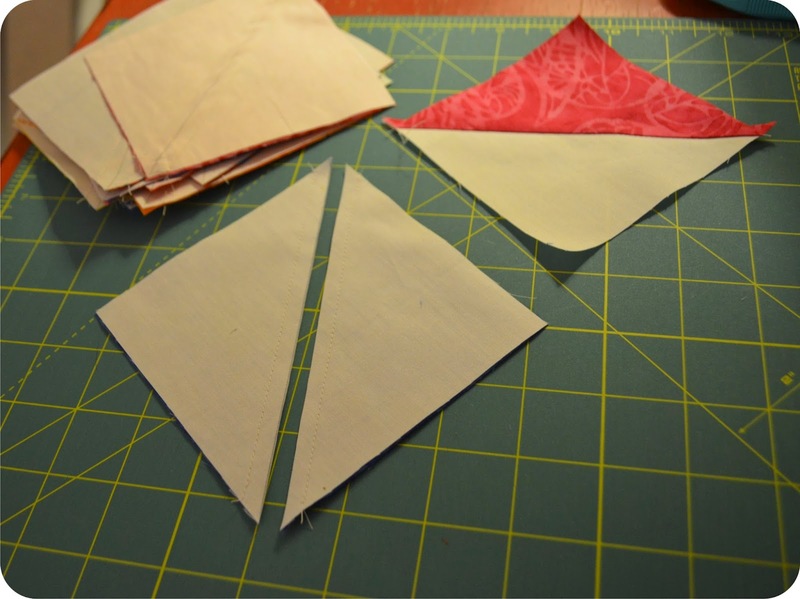 Once you have all of the blocks trimmed, you should have 40 Quarter Square Triangles measuring 3 1/2″ square. Keep these blocks in matching pairs for the next step. Layout each of the candy centers and add the matching pairs from above to become the wrappers on each piece. I made some candies with wild colors and others I kept in the same color family. This is where you can play with your color combinations and have fun. 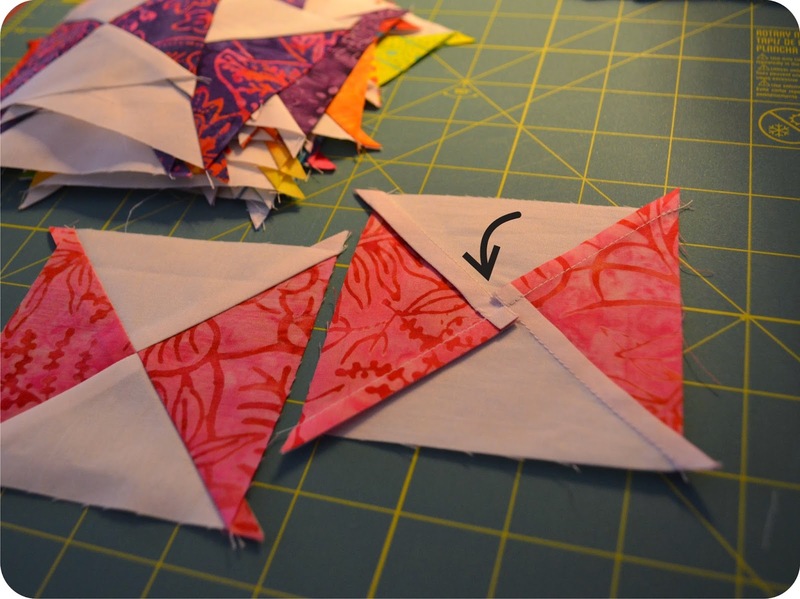 Once matched up, stitch the “wrappers” onto each center. Pay attention to the direction of the colors as you stitch. It’s really easy to sew the wrapper on sideways if you’re not paying attention. Press the seam allowances toward the center of the block. 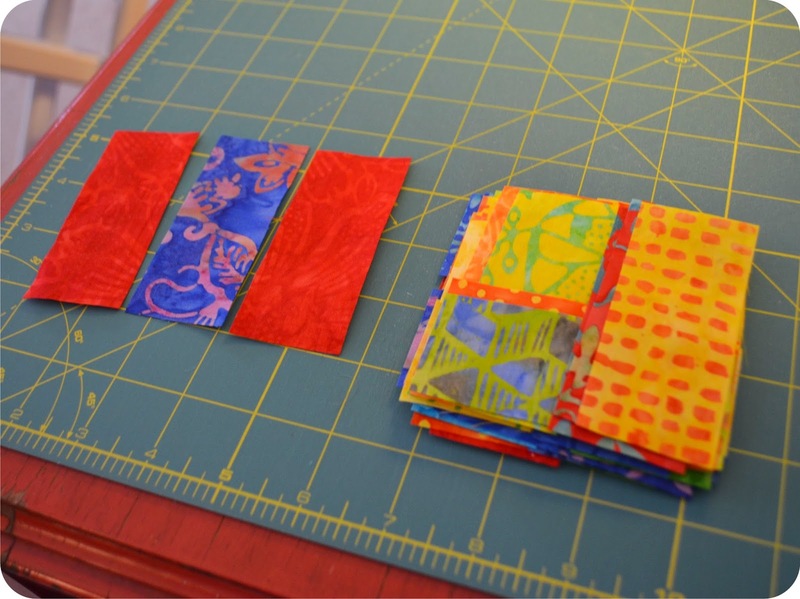 Sew a 3 1/2″ x 9 1/2″ background piece onto each candy piece. 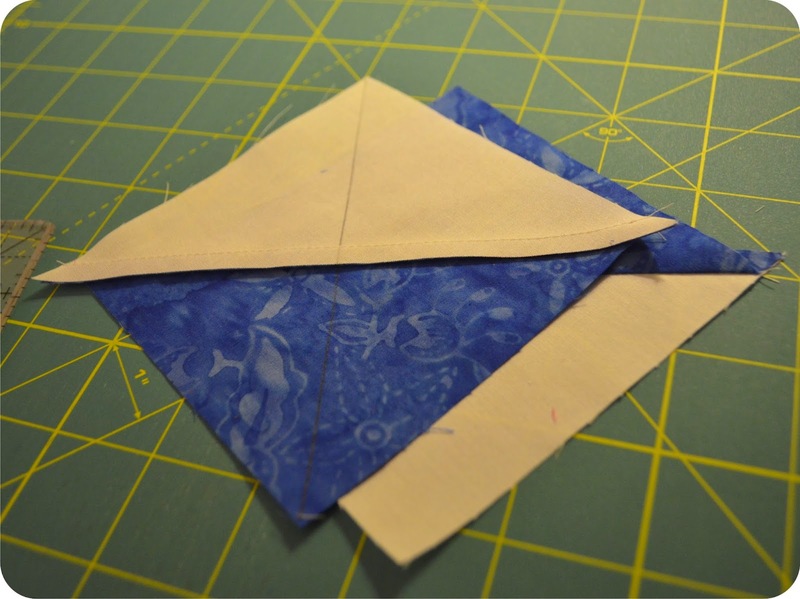 Press the seam allowances towards the background pieces. 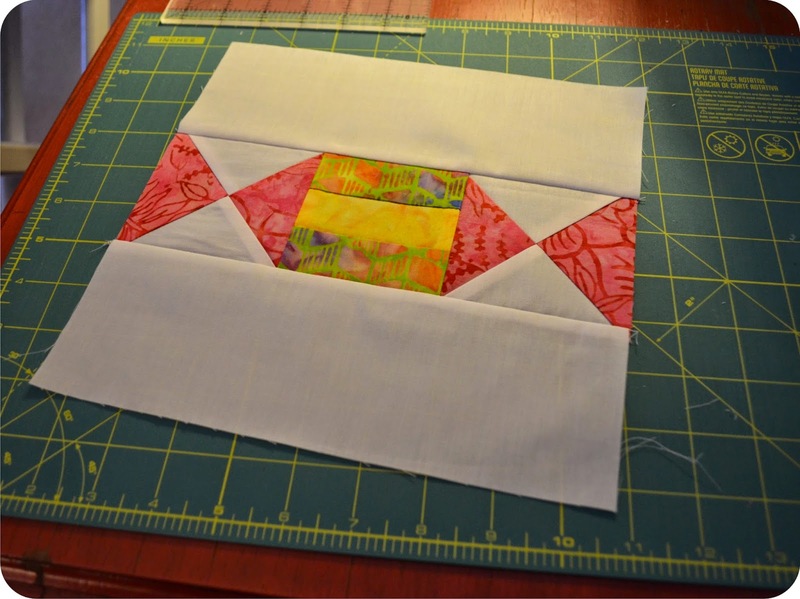 Make 20 blocks measuring 9 1/2″ square. Lay out the blocks alternating their directions in 5 rows of 4 blocks each. Adjust the colors as needed until it looks well mixed. Sew the rows together pressing the seam allowances towards the vertical candies. Then sew the rows together. Last step is to add the borders. 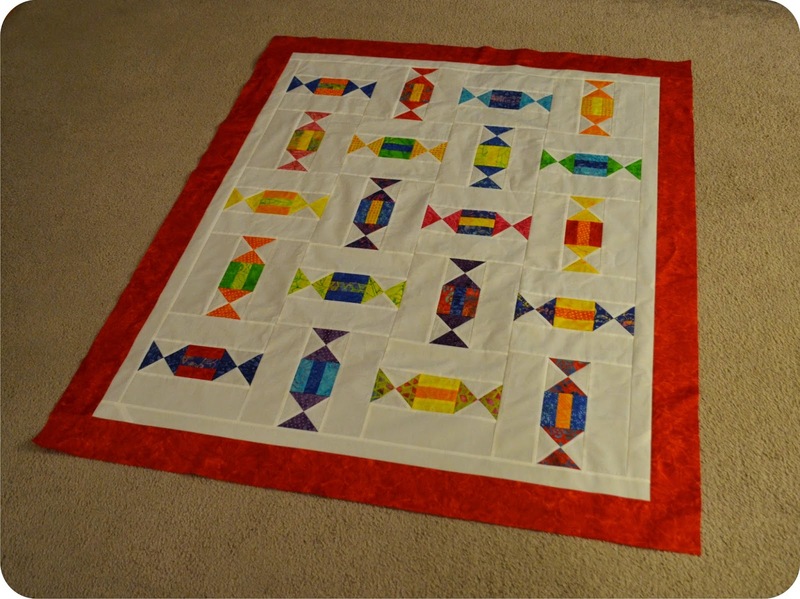 Sew both the inner background border strips and the outer red border strips together end to end to create a long strip. 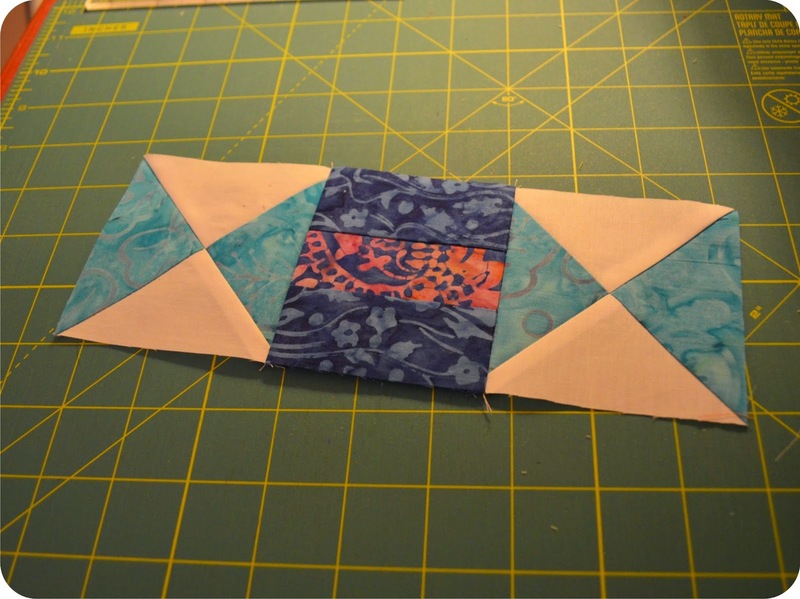 Add the inner border by measuring the length of the quilt in three places (near each side and through the middle). Come up with the average of these measurements and cut two lengths of the average measurement. Sew the cut pieces to each side of the quilt. Measure the width of the quilt now in three places to find an average width. Cut two more strips to the average width found and stitch these strips to the top and bottom of the quilt. Repeat this process to add the red border. 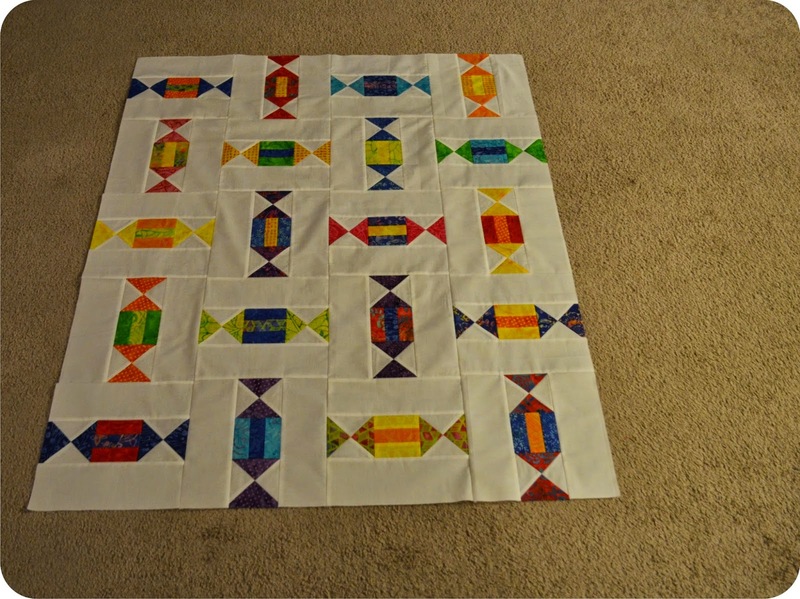 The quilt should measure 45″ x 54″. To finish off the quilt, I quilted it with a simple all over swirl pattern. Stitch on the binding (I chose a vivid green to give the quilt a Christmas-ey feel with the red border) and you’re ready to party!!! I hoped you enjoyed this tutorial. 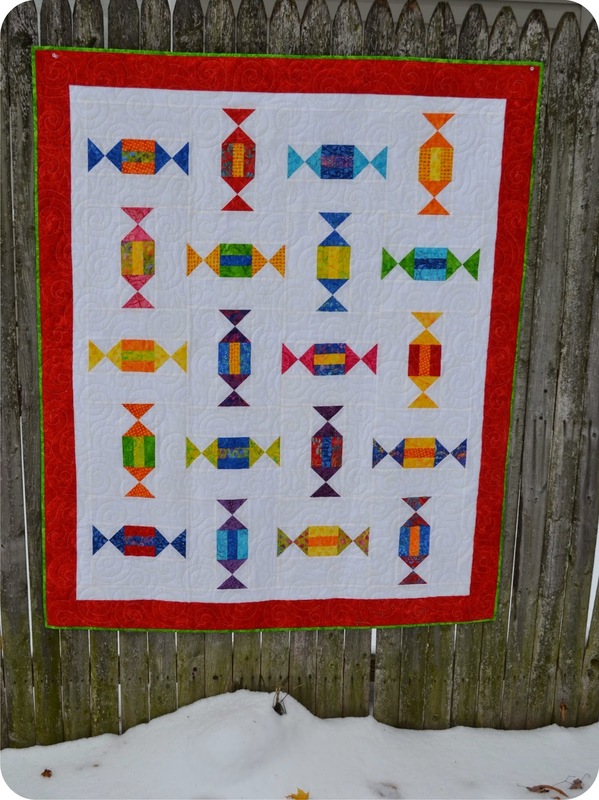 This is a fun and fast quilt to make and playing with the colors in the Carnivale pack was great! For more tutorials like this one and to read more about my quilts, books, patterns, and long-arming, come visit me over at rubybluequilts.blogspot.com. I’d love to have you drop by!!! Until next time, I would like to thank Timeless Treasures for having me on their blog!!! Have a sweet day!! !